Five Baytrail Tablets in the Sun. One Winner. 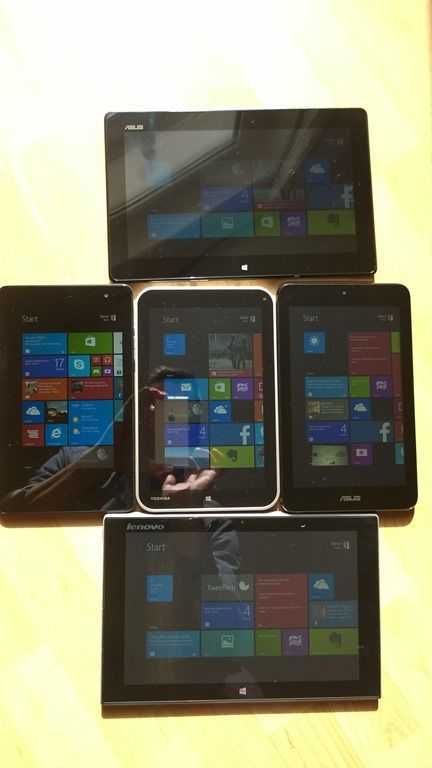 The sun is shining so it’s time to take a bunch of Windows 8.1 tablets and do some sunlight readability testing. This is an operation where I lay all the tablets in the sun, choose the best one, make a cup of tea and enjoy some reading and Vitamin-D intake. It’s a tough test. Sunlight readability on LCD panels is generally shockingly poor. I’ve seen a few laptops that have a small amount of transflectivity but in general, the technology is not good for sunlight reading. Go for an AMOLED large-screen smartphone if you really want to get some reading done outdoors. Better still, an e-ink based reader. Having said all that there’s a Windows 8.1 tablet here that does a surprisingly good job. 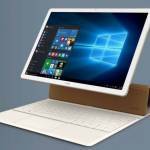 The Lenovo Miix 2 10 is terrible. Way too much grey and not enough backlight. The ASUS Transformer Book T100 isn’t far behind. 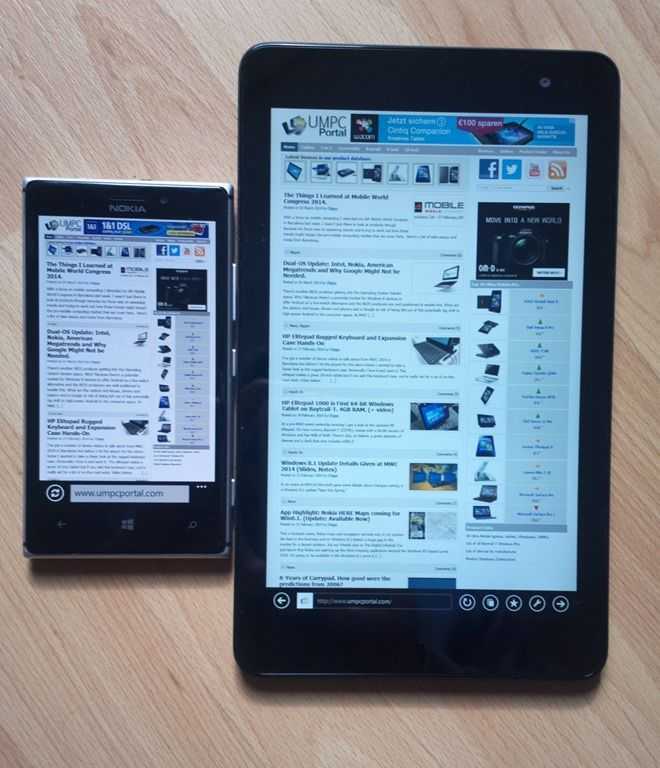 The 8-inch tablets do better but the ASUS Vivotab Note 8 is the worst of the three shown here. The two stand-out devices are the Toshiba Encore WT8 and the Dell Venue 8 Pro. It’s difficult to relay the differences via relatively low dynamic-range photographs but the images below give a good representation of what my eyes see. On the top: ASUS T100. 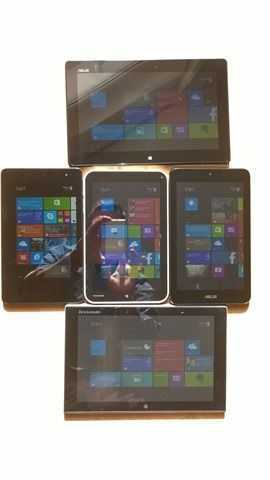 Middle row from left: Dell Venue Pro 8, Toshiba Encore WT8, ASUS Vivotab Note 8. 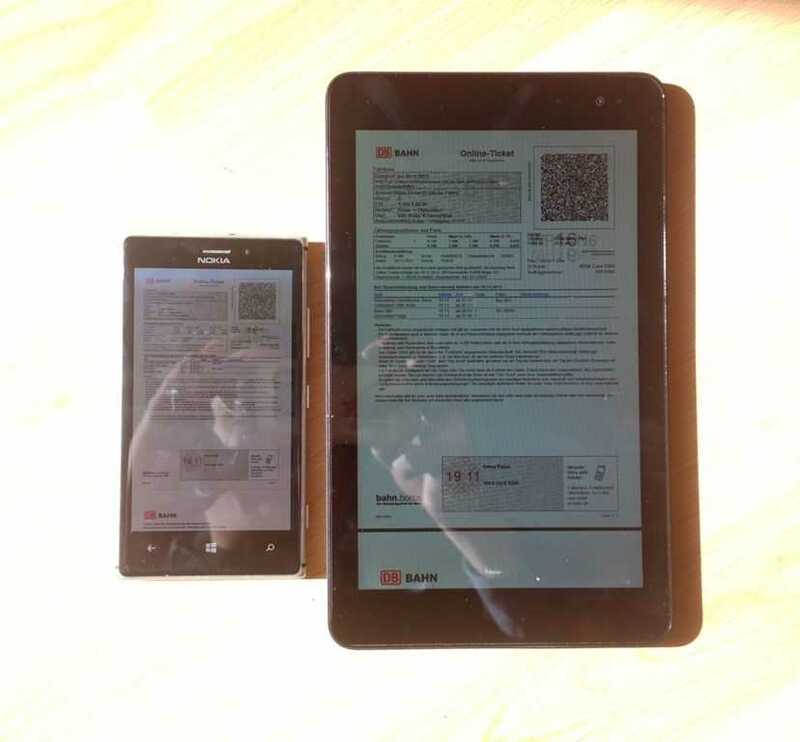 On the bottom: Lenovo Miix 2 10. It’s the contrast that really impresses me on the Dell Venue 8 Pro. You can hardly make out the frame. Black is Black. The WT8 frame highlights the grey level of the black background. 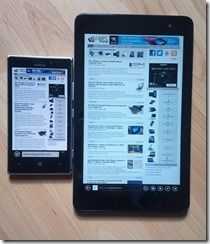 In a comparison with the Nokia Lumia 925 which has an AMOLED screen the Dell Venue 8 Pro shows that it really can work as an outdoor tablet. The two images show bright light and sunlight representations. The Dell Venue 8 Pro is the easiest to handle, has a good rubberised non-slip back, is less fingerprint-prone and now that we know if has the brightest screen here, is a clear winner for outdoor use. What about the others? The Lenovo Miix 2 8 is probably not going to compete (I’ll test later this week and update this article) but I’d really like to test the Acer W4 because in a hands-on at MWC this week I was really impressed at the screen brightness. The other device I want to test is the Lenovo Thinkpad 8. 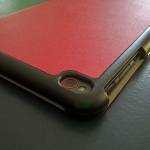 That screen is also likely to be good and also has a protective layer that rejects fingerprints. 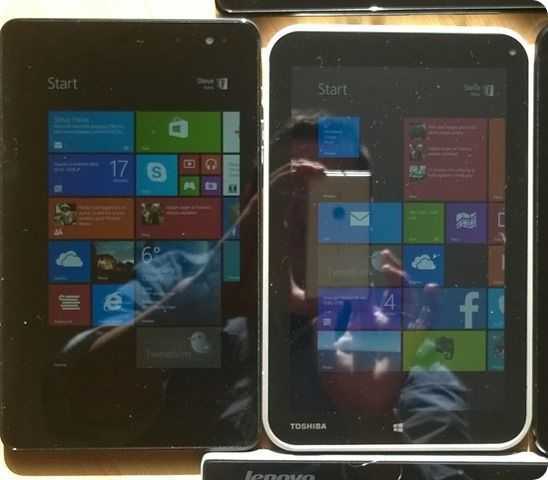 If you’ve ever compared the screen on the Dell Venue Pro 8 next to the Lenovo Thinkpad 8, let us know. Adaptive screen brightness was turned off for this test. Huawei Matebook. Thin, light and…expensive. 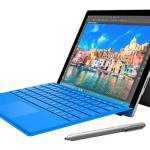 Surface Pro 4. New thermal design appears to work well, and that’s very, very important. Cool! Thanks man. Glad to see my DV8P doing well. I had a Panasonic Toughbook at work and that thing was almost impossible to see outside. 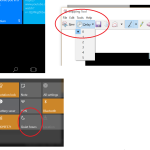 I vowed never to deal with that again, so visibility in sunlight is one of my major requirements for a tablet. I use my DV8P outside or near big windows on a regular basis and never have a problem seeing the display. Thanks for that feedback. Good to have a second positive opinion. 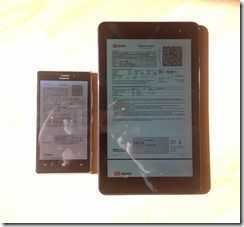 The ASUS Vivotab Note 8 looks decent enough in comparison. So far it’s the best 8″ tablet to get. Good thing I decided to postpone my purchase of the DV8P due to the separately sold, battery powered, non-stowable and issue riddled stylus. A mouse pointer is the bare minimum requirement for me. I thought about using one of those virtual onscreen trackpad software but it wasn’t so great on the tablets I used it on it. « The Things I Learned at Mobile World Congress 2014.